These are not my own thoughts, but in fact the thoughts of others. Though I do not do this type of post much, I wanted to share the thoughts and appreciation of other fans regarding the leave of Morning Musume's Michishige Sayumi. Please respect the opinions of the original writers, thank you. **I want to thank both Calli and Mendez for allowing me to create this post after I asked if I could. I was moved by their appreciative pieces regarding Sayumi's graduation, and I truly wanted to share them with you all! So once again, thank you to them both! So a few days ago before and also when Michishige Sayumi graduated, I was on Facebook and found two posts of Appreciation for Morning Musume '14's former Leader and the last standing 6th generation member. Both of the posts really touched me and, of course, made me bawl like the emotional wreck I truly am. The two posts I saw are by friends of mine, so I asked them if I could share their beautiful posts of Appreciation here on my blog for others to see to show my lovely readers what other fans have to say about Morning Musume's 8th leader. This post will be focused on what both Calli and Mendez have said, rather than what I say. I really appreciate that they both have allowed me to share these Appreciation posts with us all, and to know that others were writing such beautiful words towards Michishige Sayumi before or after her graduation really made me emotional and happy; she was loved by many, and on her graduation day it showed, and so I share with you two posts from two fans who loved her dearly. So without further ado, please read on and take in both messages from Mendez and Calli and see if you identify with their feelings, too. Michishige Sayumi. Sayu. Shige-pink. Usa-chan~peace. These are all names this wonderful lady goes by. Now, even if I am not the biggest Sayu fan, it does not stop me from loving her. She is just so adorable, and even if her narcissism may mask it sometimes, she is very kind-hearted. She is such a pretty young woman, with a soothing speaking voice and a -- well, interesting singing voice. She has a perfect bikini body and when you see her you don't know whether to hug her tightly or cream your pants over her. She's that kind of girl. Sayu is a woman who shows she will do anything to advise her juniors. Although she seemed to be one of the more juvenile members come the 6th generation's debut, over the years she has shown herself to be a strong woman and an amazing leader. She is a girl who gets along with people of all ages, for she has a little bit of every age in herself. She is youthful and playful, while also remaining mature and respectful. The latter was showcased in one of Morning Musume's new songs of the new triple A-side, "Mikaeri Bijin." It is a song sung in unison as dedication to Sayumi. The juniors, AKA 9th-11th gen, sing this song, as an appreciation. In this PV, Sayumi is shown wearing a beautiful traditional Japanese outfit. She is shown writing letters to her juniors, which they later open as she leaves the building and they cry. I do not blame them. Losing Sayumi for them is losing a close friend, a senior, and an asset to the group. If we as a Hello! Fanbase think losing Sayu is hard, imagine what they must be going through. In the above picture, I compiled two pictures: one of 2003 Sayu promoting "Shabondama" and one of 2014 Sayu promoting "TIKI BUN." Even just through these pictures, you can clearly see her growth as an idol and the maturity she has gained. In a couple of hours, Morning Musume will be losing the member that has held the group together like glue. She has been the member with the longest tenure in Morning Musume history, spanning 11 years. We have watched Sayumi grow from a child to a young lady. As I have mentioned, even if Sayumi may not be my favorite member, I definitely have a special place for her in my heart. We love you and we will miss you, Michishige Sayumi. Thank you!Thank you for your 11 yrs in Morning Musume! !Given I wasn't her fan when I discovered the group 4 yrs ago when I was focused on Koharu and Gaki san but you have shown how important the group is for you after every graduation and you have shown how strong you really are. You have matured in a way i didnt think i would ever see. When Sayu became leader of Momusu 2 yrs ago she essentially changed the way I see her and I completely admired her for it because she put the other members first before her and gave them the ability to shine in the spotlight! Sayu became leader at their historic 50th single and during her leadership morning Musume had 5 consecutive #1 hit singles. 11 yrs ago when Sayu first joined she couldn't sing, was ridiculed for it but you stood your ground and not only did you grow up to be a beautiful young woman but have become a true idol in everyone's eyes. I had hoped to see you in MM for a few more years and after having the pleasure of meeting you in NY last month it's gotten really hard to let you go!! I have a deep sense of respect for Sayu as the last remaining member of a past era and I love her for all her hard work and as her graduation is later tonight at Yokohama Arena I can't help but to be sad that she's leaving!! You truly have inspired your kouhais and they will continue the legacy of Morning Musume in the next generation to come!! So thank you Sayu and we will never forget you!! Congratulations on Graduating. Honestly, I found these posts beautiful when I read them. I woke up at 9am on the 26th, when Shige would be graduating, and the first things I saw were these posts; I started crying then, because what Mendez and Calli had written was so lovely and heartfelt. 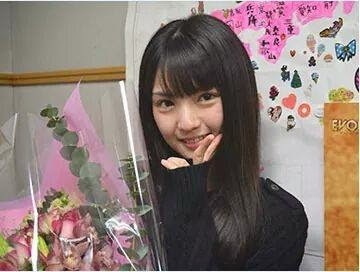 I knew that I wanted to share them with others, so that they could see how others saw Sayumi. For both Calli and Mendez, I commend you for your wonderful posts; you two really captured your feelings for Sayumi, and Sayumi herself. You truly appreciated her in such short form, but I still felt your love, respect and admiration for her as a member of Morning Musume, a leader. I thank you for letting me post these messages of yours here, for others to see. I hope that you all enjoyed these posts as much as I did, and I hope that you can also identify with them in a way too; you have said how you identify with my words, but what about the words of others? It would be interesting to see how that plays out. To both Calli and Mendez, thank you. Thank you for letting me share your words, and thank you for loving Sayu until her last day as a member of Morning Musume. As you both said, we will miss Michishige Sayumi and never forget her. Even days after her Graduation, we still think of her... or at least, some of us do. I hope you all have a wonderful day and thank you for reading~ We appreciate it.